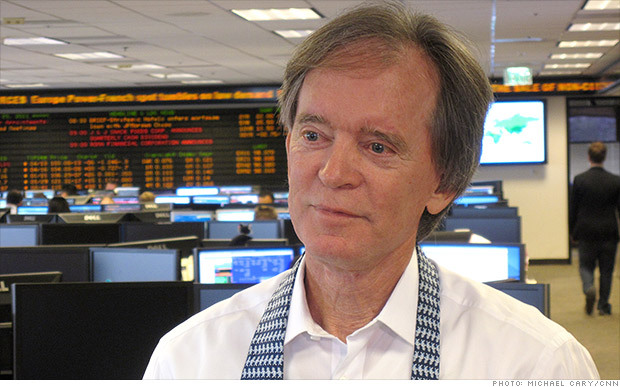 Bill Gross loves cats, and making money. Granted, the bulk of the letter concerns actual investment strategy. Gross examines something called the Sharpe ratio, which is designed to tell whether a portfolio's returns are due to smart investment decisions or the result of excessive risk. But the part about the cat is much more interesting. For example, Gross tells us that Bob, a female cat, would watch him as he entered and exited the shower. Bob's "obsession" with Gross was so powerful that she would tune in whenever he was on CNBC, according to the letter. In case there was any doubt, the letter includes a snapshot of Bob watching Gross on TV. But we get the sense that the obsession went both ways. Gross says he would ask Bob for recommendations on pet food stocks and that she would respond with "one meow for 'no,' two meows for 'you bet.'" Still, Gross isn't just cat crazy. He also writes fondly of Honey, the golden retriever that was part of his family in the 1980s. The letter also mentions "Wiggles and Daisy and Budgie." Gross doesn't go into detail on these three, other than to say they were "lovable pets every one of them and perhaps just as importantly – pets that loved us." Gross is known for using colorful metaphors in his monthly commentaries. Past letters have featured references to the poet William Butler Yeats; legendary hype-man Flavor Flav; and Scrooge McDuck of "Duck Tales" fame. But his reputation has taken a hit since Mohamed El-Erian resigned as co-chief investment officer at Pimco late last year. In February, Gross was the subject of a scathing article in the Wall Street Journal that portrayed him as difficult to work with at best, borderline megalomaniac at worst. The article, citing unnamed sources, claimed that El-Erian left out of frustration with Gross' behavior. Gross went on CNBC shortly after the article was published to give his version of events. While he acknowledged being a demanding boss, Gross noted that he often encouraged Pimco employees to dance around the trading floor in a conga line as a way to relive stress. The management issues at Pimco have apparently spooked investors in the firm's flagship Total Return Fund (PTTRX). March was the 11th consecutive month that investors withdrew more money than they put in the fund, according to Morningstar. Perhaps cats, known to be internet sensations, will also work their magic to attract investors back to the fund. In any event, Gross is not the only celebrity investor to go long felines. Warren Buffett, the famed value investor from Omaha, recently recommended cats, particularly kittens, in this bizarre YouTube video.